A commemorative plaque to Sir George Shearing, instigated and organized by The Battersea Society was unveiled yesterday, Saturday 22nd April at Northcote Lodge School (26 Bolingbroke Grove, London, SW11 6EL), formerly Linden Lodge school for the blind, the school that George Shearing attended,- it moved from the site in 1964 to Wimbledon - writes Paul Wood. 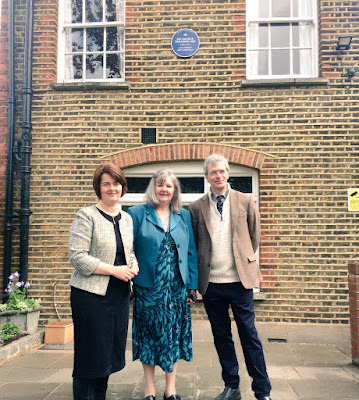 The unveiling was made by Alyn Shipton with written tributes from Brian Kay, formerly of the Kings singers, Lady Ellie Shearing and Charlotte Kirwan , an ex-pupil of Linden Lodge, who shared her memories of playing a duet with George when he visited the school in 1962. The event was attended by a large number of George's family and relations -there was also music from pupils at Northcote Lodge School. "George Shearing - a pianist, jazz musician, bandleader, composer, and as all who knew him will testify, a great wit as well - is being commemorated today, not least because he was the first British instrumentalist to become a household name in the United States - the birthplace of jazz. That’s an achievement in itself, but particularly so as George was blind from birth, and learned many of his skills as a pianist here in this very building in the 1920s and early ‘30s, when it was the Linden Lodge School for the Blind. The programme was recorded, and afterwards George and his wife Ellie took me aside and said, this has been so much fun, how would you like to come over and turn these conversations into a book? And so for the next three summers, when George was at his UK home in Stow on the Wold, I’d pop over between his beloved radio broadcasts of test matches (which could not be interrupted) or his occasional concert dates in Britain, to carry on working on the book. I learned of his life with Stephane Grappelli’s quintet during the war, and his subsequent move to the USA. Of the clubs of 52nd Street, of the particular kindness and generosity of Charlie Parker, the encouragement of Lennie Tristano and the harmonic adventures of Monk and Powell. And of the formation of his famous quintet, whose record of “September in the Rain”, George told me, had sold “upwards of 900,000 copies”. Of course by the time we met, it had passed the million, but he was always too modest to say so directly.The band was a landmark in so many ways, not just for its popular success, but for featuring a female instrumentalist, Marjorie Hyams, and a racially integrated line-up with John Levy and Denzil Best, both African-American, joining the rhythm section. George always said he was colour and gender blind when it came to jazz - and as his line-ups over the years suggest, he always just chose the finest players, including Gary Burton, Toots Thielemans, Al McKibbon, Louis Stewart, and a host more. And in his long and dazzling recording career, there were some great highlights, including work with Peggy Lee, Nat King Cole, Joe Williams, the Montgomery Brothers, the Kings’ Singers (remembering George’s abiding love of classical music) and - above all Mel Tormé, whom George always said was the other half of his musical brain. It is great to see so many people here today, including members of the Shearing family, and his many friends from the music world, including the most wonderful singer Ian Partridge, who, like George has given so many of us so much pleasure through the power of music. 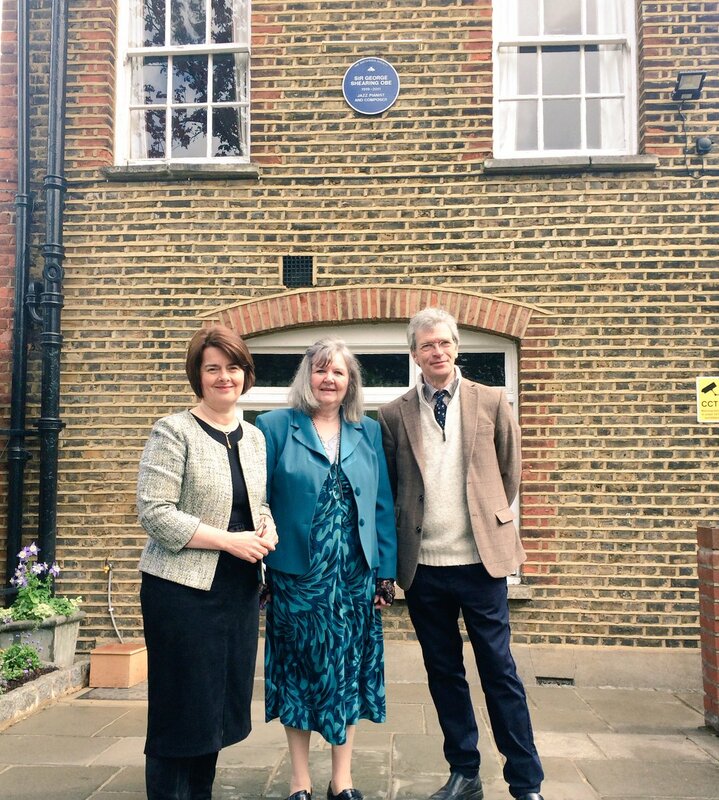 And so now it is my most pleasant duty to unveil this blue plaque to remember one of the most distinguished musicians this country has ever produced." Thanks for reporting on it. Here is blogpost on it the unveiling to George Shearing - a Battersea lad who has a youth centre named after him in Shillington Strret Battersea which is opposite Shillington School which he attended before Linden Lodge.